Crowned the Godfather of Go-Go by fans and critics alike, bandleader, singer and songwriter Chuck Brown and his backing ensemble the Soul Searchers bring blazing soul and funky r&b beats to make sure that nobody is sitting down. Brown led the vanguard in Washington DC’s go-go scene mixing Latin rhythms, African call-and response, chants, jazz, and gut-wrenching old school soul with a relentless driving backbeat. 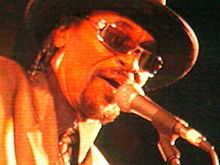 Brown and the Soul Searchers catapulted to the top of the R&B charts in 1978 with the horn-heavy classic “Bustin’ Loose”. Source:River to River Festival. Find more free concerts in the Summer Concert Guide.